But, amid the sameness of spring styles, and though it all still sits under the aforementioned Boho Umbrella (Bohumbrella? ), this year there is a definite Western U.S. and 1970s California vibe that, given my recent proclivity towards bison skulls and bourbon, and jumpsuits and fringing, suits me just fine. There are a few key pieces that can make this look really work. Obviously anything with turquoise. Suede and leather (real or faux – whatever works for you). Fringe. Silver. But also look for broderie detail, and tailored lines. This look is all about mixing utility pieces (boots) with pretty pieces (flowy dresses) so mix and match as suits you. I can’t wait to get my hands on that Zara Bandana necklace. And I have that H&M saddle bag in black, and it’s one of the best things I’ve ever purchased. It’s compact enough for a night out but holds a startling amount, and looks a lot more expensive than 25 quid. And hats! I could do a whole other piece on hats for this look. I’m hesitant to recommend anything too wide-brimmed in this windy climte but as long as it’s afixed well to your head, have a field day. 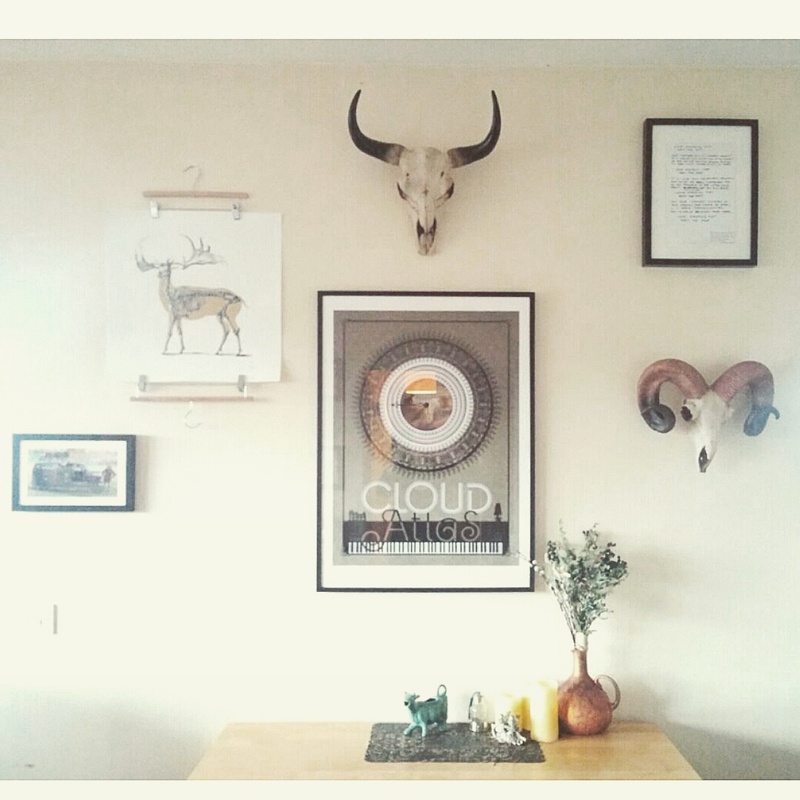 Think I’ll throw on some Carole King, drink some bourbon, and gaze at my newly afixed bison skulls. We all have those clothes. The pieces that you just don’t wear anymore but can’t quite bring yourself to give to the thrift shop. Maybe it was really expensive and only worn once or twice (or not at all…). Maybe you wore it SO often that it has immense sentimental value, but just doesn’t suit your life anymore. Answer is simple. Have a Swapsies Party! My friend Janet (an amazing photographer – check out her Facebook page, Blackbird Boulevard Photography) hosted our first one a couple of years ago. We generally now do them 4-5 times a year and each one is better than the last. It’s so simple! 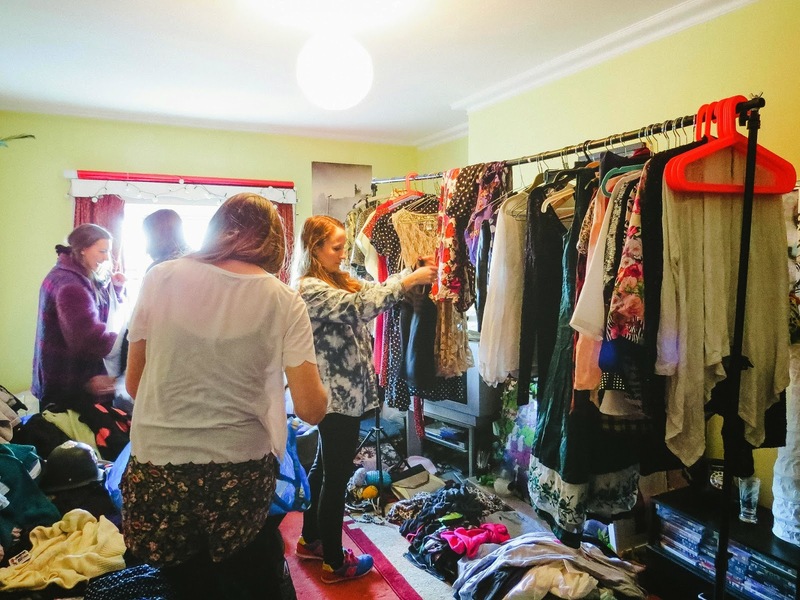 Get a group of your friends to round up their undesirable clothing/jewelery/gently used cosmetics/etc. (size of the group depends on size of the host space – we find it generally works best with about 6-7 people in a small-ish apartment). Display the clothing around the room (pro-tip: get your hands on some clothing rails, if only for the afternoon). We generally put dresses on a rail, and then have a couch for tops and a couch for bottoms, a chair with jackets/coats, a table with jewellery/miscellany, a section on the floor for shoes and bags, and a “bargain bin”, which is just a large bag or basket that has basics and very-loved items in it. You’ll find that sometimes you’ll need another section – last time, for some reason, we had loads of scarves, so there was a rail just for them. Chaos! One two three grab! Everyone rushes around the room, grabbing at will. If you’re smart, you’ll make a plan with your buddy beforehand – one of you can take each side of the room and grab things for the other person. There’s a strict “no touching” rule before the grab in our group (apart from the intial display period) so garments are flying everywhere while people see what they want. Then – the lull. This is the key part of swapsies. Everyone tries on everything they grabbed, then and there. If you’re a bit more modest, you can retire to a bedroom or bathroom. Anything you’re unsure about gets a group vote. And this is when the actual swapping comes in – maybe someone got that kimono you had your eye one – but you also managed to grab a pair of boots that she wanted. Perfect opportunity to orchestrate a trade. Did I mention that while all of this is going on, there’s wine and snacks and music? Swapsies can be intense, but it’s so much fun. And I’ve always come away with great items – including a beautiful TopShop playsuit, and some burgandy velvet leggings that have garnered me loads of compliments. It’s also fun seeing what items come back around. There was a pair of leather pants that took a few goes before finding their perfect home. And a great yellow and black checked dress that is now on it’s third person, just because the first two felt they’d gotten their use out of it. Plus, at the end, anything not taken gets brought to the charity shop or Woman’s Aid. And there’s always a LOT left over. 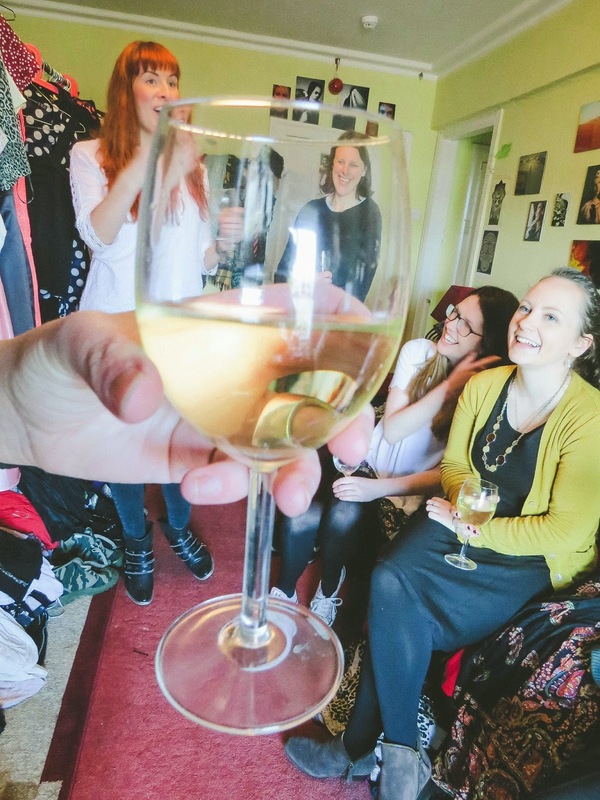 So if your wardrobe needs a revamp and you don’t feel like spending more than the cost of a bottle of wine – or if you just want to do a little spring cleaning – organize a swapsies party with your friends. Tell us about it if you do! 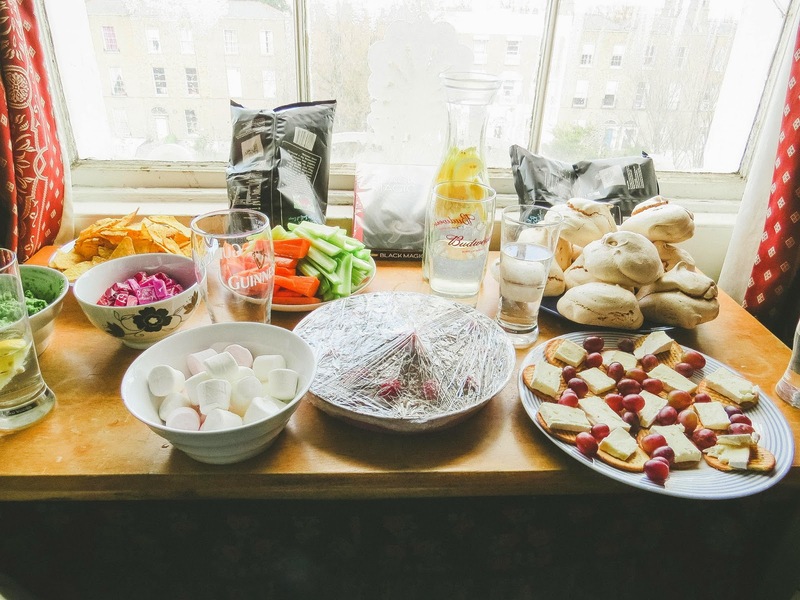 In case you missed it in the captions…many thanks to Aoife O’Sullivan of Ruby Sky Photography and Disassemble Dublin for chronicling our last Swapsies Party! The first time I heard of a 12 Pubs crawl (way back in 2010) I thought it sounded sort of fun, if not entirely doable. 4 years later I have a mild panic attack whenever I see a group of holiday-jumpered revellers approach a bar I occupy. But a few months ago, when chatting to my friend Ruth about doing a day of hitting some thrift shops and then heading to the bar, I thought – why not both at once? Luckily, I have a group of fabulous clothes-minded friends who were up for the challenge – and we had a great time, as you can see below. If you have a large group, come up with a loose schedule – for example, say you will be at Bar A at 1pm and leaving at 1.30pm. You will be in Bar B at 2.45pm and leave at 3.15pm. Hit the thrift shops between those two bars in the mean time. If someone immediately finds a shop to be a no-go, they can go on ahead to the bar and get an extra tipple in. If you have a smaller group (as we did) you can play things a little looser. We were all pretty much moving at the same pace so we just made our way down the street, picking bars ahead of time and hitting all the shops in between. In the end we only hit 3 bars – but got to 15 thrift shops, which for 5 hours was really good work! While I love to shop alone, digging through thrift stores that is much more enoyable as a communal endeavor – after all, you have multiple sets of eyes flicking through the racks on the hunt, and if they’re the right sort of friends they’ll share what they find! I went for my standard marathon-shopping outfit – a long black thin-strapped tank top, black tights, and slip off shoes (not dissimilar from my Travelling Look) and a coat with snap buttons. All of this allowed for super fast changing. And provides a good base if you’re trying on a jacket/kimono/cardigan/etc. Have your smart phone handy. I was in a vintage store a couple of weeks ago and found an amazing coat priced at €50. I was on the fence. Great coat, but a bit pricey for what was supposed to be a frugal shop. So I googled the brand label, and a description of the coat…and found versions of it selling on eBay for everywhere from $450-$700*. So I got the coat. I’m not saying that everything you pick up needs to be designer – maybe there was a dress in Penney’s last year that sold out before you could get it, and now here it is in a thrift shop for a fiver – great! But it is good to be aware of the brands along with the obvious things to look at when thrifting (wear and tear, etc.) You (probably) don’t want to pay €20 for something that you could still get new at H&M for €25. So – if you’re a little skint post-holidays but still want to get your shop on, I highly recommend grabbing some friends and trying out one of these for yourself. We’re doing another one at the end of January and I can’t wait! In the end I walked away with two bulging bags with great finds – and the drinks made me a little more adventurous in what I picked out! 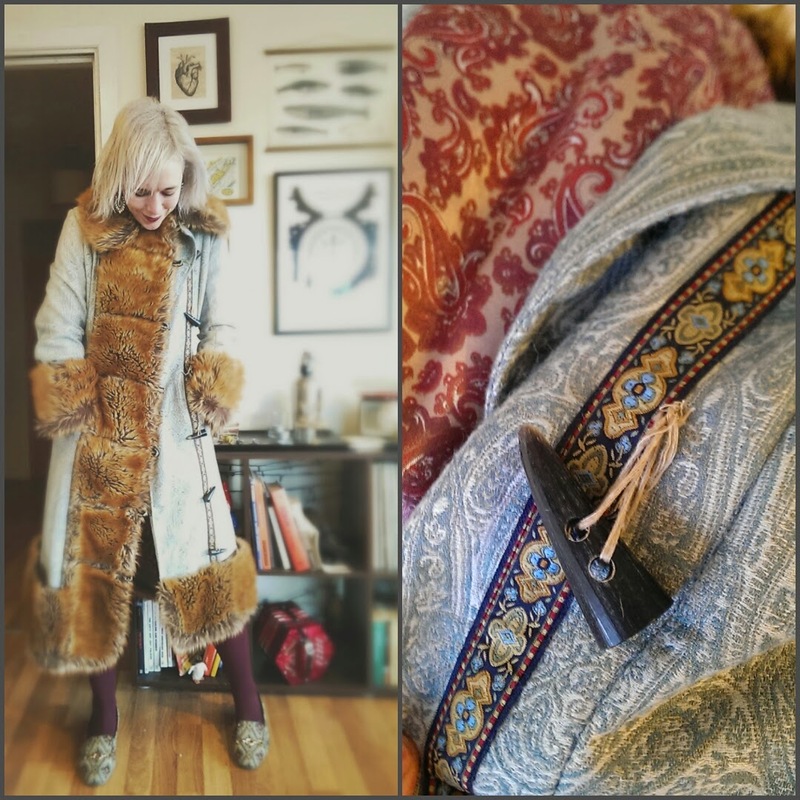 *The coat I have has a label sold in Anthropologie and Free People, hence the how pricey it was originally in the store, and why it was selling for so much. But I also did a reverse image search and discovered a woman selling the EXACT SAME coat with the Denim & Co. label (that’s right – Primark). I could see the label clearly in the picture, and she confirmed in her blog that she bought it in Primark in the early 80s. Exactly the same coat, down to the most minute details. So sometimes the knock-off effect works in reverse if enough time goes by – I’m sure they both came from the same factory, but the 25 year difference affected which company wanted sell and market it. I have, thankfully, not had to go on TOO many interviews in my life (so far…) but I have been on my fair share. I’ve also been on the other end of the table, interviewing potential candidates. There are probably a million sites (actually, Google says 55,300,000 results for this title) that talk about this topic. I’ve visited a lot of them in my day. Most are good, but some miss some key things, which we’ll touch on below. Many will emphasise the need to look professional. They’ll urge you to buy a suit, not to wear anything to flashy or revealing or distracting (or fun…). It’s not that this advice is bad, per se. It just doesn’t take into account certain conditions. Do some sleuthing and find out what the other people in the office (and in your desired role or similar) wear, and then up it a notch. If it’s a jeans and t-shirt kind of place, maybe go for nice jeans with a sweater or plain t-shirt with a blazer or the like. If it’s a business casual sort of place, look a touch more elegant than your average work wear. Show that you’ve done your research, and put some thought into your apparel. If everyone in the office is wearing jeans and you show up in heels, stockings, and a suit, they might wonder how you’re going to fit in. It’s a cliche for a reason – first impressions matter. Along those lines, know your profession. If you’re interviewing for a charity working to prevent the exploitation of workers, maybe make sure your clothes are ethically sourced (which we should do anyway, but I don’t always practice that so I won’t preach). Maybe they won’t notice – but if they do, it’s another easy point for you. If you’re interviewing to be a bartender in a heavy metal bar you should dress differently than if you were interviewing to be a bartender in five star hotel bar. If you’re trying to get a job in a clothing shop, wear their items. Another thing to consider – wear your glasses. We may not want to admit it, but apparently most of us think that people who wear glasses are smarter. 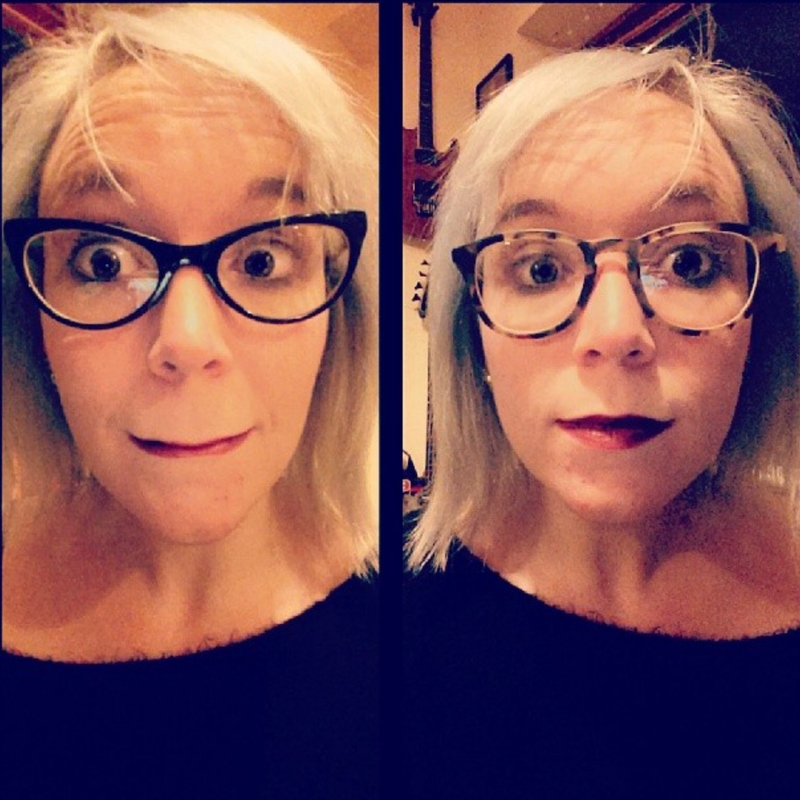 I can’t bring myself to suggest getting fake ones (unless you like the look, then go for it, I guess) but if you, like me, alternate between glasses and contacts, make your interview day a glasses day. Don’t wear something brand new. Maybe that dress looks smart and sophisticated in the changing room – but then you realise when you sit in it it rides all the way up. Maybe those shoes are just the perfect height and colour, but they have a horrible squeak once you start walking in them. Give the outfit a test run (this is actually something you should do when travelling as well). Finally, when in doubt, go neutral. I don’t necessarily mean black and grey – colour is good (though I would argue against neon or anything too loud, unless of course, that’s the sort of place you’re trying to work in). I mean neutral cuts – shift dress, well cut trousers, blazer and shirt, etc. Again, a lot of places advise against anything too flashy, but I think one statement piece is worth doing. Conversation starter, etc. The most important thing is too look well put-together and to be comfortable and happy with how you look. Let your clothes give you confidence, and let that confidence exude in your interview. If you never wear a suit, and will never have to wear a suit in the job, why wear one in the interview? You won’t be comfortable. They won’t be comfortable. It’ll be a disaster. But find the perfect balance of looking your best AND feeling comfortable, and you’ll be that much closer to nailing it. Don’t show up too early, unless you’re specifically asked to (for filling out forms, etc.). 5 minutes is a good rule of thumb. Not every place has a reception area, and if you show up 20 minutes early they have to figure out what to do with you, taking time out of their day. This is especially true if you’re interviewing with someone senior – as someone who worked as a PA for many years, I can tell you that their schedules tend to be VERY regimented. Ask questions. Just search “What questions to ask” at an interview if you’re stuck. Even if you think they’ve told you everything you want to know, show your interest by asking more. Always ask why the last person left. Research, research research. Know the company, their competitors, their reputation. If it’s not within walking distance, and you don’t drive, take a cab. It’s worth the extra money. Even if you think you’re too broke, figure out a way. It takes the stress of public transportation and allows you to keep your composure. And even though you shouldn’t show up to the actual interview too early, make sure you allow plenty of time and go to a nearby cafe or just take a stroll. I was never one of those kids that was particularly outdoorsy. As an adult…I’m still not particularly outdoorsy. And though I don’t jump on a chair and shriek at the site of a creep-crawly in the house, I do get startled by their presence. I say all of this as a disclaimer, of sorts – I am NOT the cool girl that is super into bugs. First off, I have to apologize – there are a couple of items in this set that aren’t available anymore (or, more hopefully – at present); I know, that’s a super jerky thing to do. But they do represent some of my favourite ways I’ve seen the insect trend crop up lately. They’re a great blend of edgy and pretty, and can work through the holiday season (such jewel tones!) and through the summer (and come autumn, nothing says Halloween like some spider themed apparel. Of the above, I have the ASOS Digital Insect Print Dress (it fits loosely, so if you’re looking for something a little snug maybe size down), the Pull & Bear sweatshirt (I basically accosted a woman who was wearing it in the cinema the other day, simultaneously gushing over it and demanding to know where she got it and when), and the green-winged bee earrings from Modcloth (unfortunately one of the sold out items) – I love how they have an Art Deco feel to them. As for the others, as soon as that Coco Fennell dress comes back I think I’ll be taking the plunge, and I’ve had my eye on those Miista loafers as well. 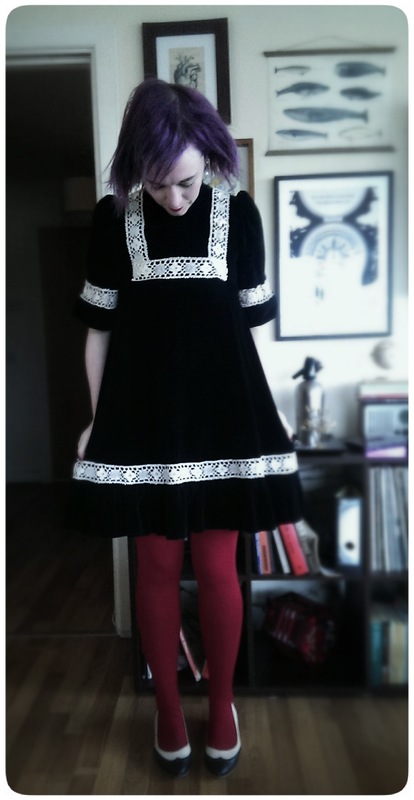 Final note – I have some other dresses by Folter – they run a little big as well so again, I’d size down. I have a feeling this is a trend we’ll be seeing more of, so keep an eye out! One of the reasons I love living in Ireland is the ease in which I can travel not only to completely different countries (an ease which, admittedly, I should take advantage of more often) but also seamlessly from city to country. Thanks to the kindness and incredible generosity of a dear family friend, I’ve been trans-Atlantic and trans-continental travelling since I was quite young. As such, I like to think I’ve perfected the perfect travel outfit. Plane, train, car or boat, these basics will keep you comfortable and stylish. This is straight from the George Clooney classic Up in the Air, but it’s one I feel strongly about – wear shoes you can easily take on and off for going through security. Also, if you can avoid jewelry, do – and if you can’t (or it conflicts with the rule below), keep it in your carry-on until after you’ve passed through the body-scanners. If packing space is limited, whether because of a budget airline or because you want to keep everything carry-able, wear your bulkiest clothing – provided it’s comfortable. That last part is key (you can tell because it’s in italics). This is an instance where you can ignore the first rule (God, I’d be a terrible parent. Telling you how to break the first rule on the second). If you want to bring boots and they’re going to take up valuable bag space, wear them on the plane. Bulky sweaters or coats as well. HOWEVER – if you’re checking a bag, take advantage of it, and let yourself travel as lightly as possible. Why carry around your coat all through the airport when you can stick it in your bag and unpack it before leaving the airport on the other side? My go to travel outfit consists of very thick black tights (leggings also work), my Fly London wedges (which are SO COMFORTABLE), and either a black cotton/jersey dress, or else a combination of simple black jersey top and H&M black jersey skirt (the latter is an absolute staple wardrobe piece, and if you don’t have one you should go out and buy three). If I don’t need a coat on the trip or it’s already in my stored luggage, I wear a black cardigan and top it off with a pretty wrap/scarf. A backpack is preferable – there is a great convertible satchel at River Island at the moment in several colours that I can highly recommend. This look allows me to be both comfortable and chic (black is just always an easy choice). I’ve never been upgraded but I firmly believe that if I continue to look sophisticated enough it will happen – however, I’m not going to sacrifice comfort. This look allows me both. It also gives me a good base in case I need to go straight to a meeting…or if my luggage gets lost and I am stuck in the outfit for a while! My hair has been pretty much every colour. Its natural hue is somewhat akin to “dust” so for the last 10+ years I’ve been experimenting non stop. Oddly, this hasn’t left my hair in the dire condition you might imagine – if I’m getting my chronology correct, I’ve gone from blonde highlights to red highlights to all over red to purple to dark brown to red to black to blonde (and back and forth between the latter three several times) before finally getting my hair to it’s current silver shade I’ve wanted for so long. Making your hair essentially grey on purpose isn’t for the faint of heart (there is, like Picasso, a “blue period” at the beginning) but I love it and get loads of compliments on it. 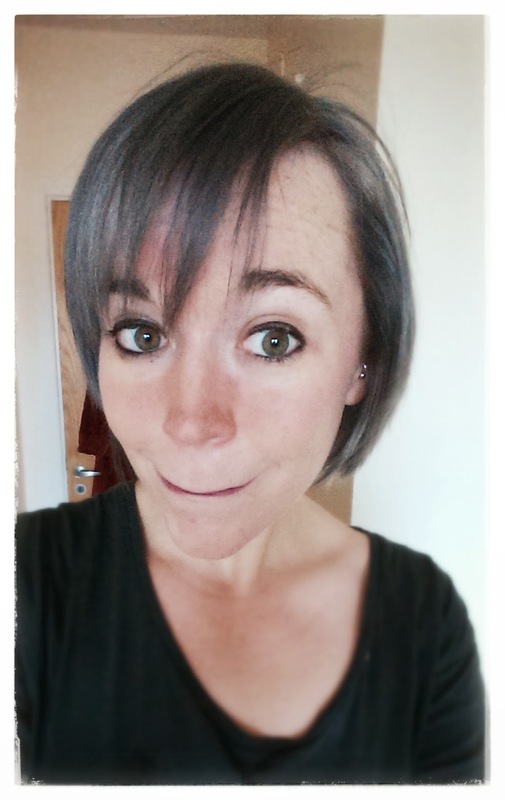 In fact, last time I went to the hairdressers I took it a step further and requested pewter, which I adored. This was gifted to me by a friend and it is the best “blue” shampoo I’ve used. It has a wonderful scent, is gentle enough for me to use every other day (which is generally how often I wash my fair) but still strong enough to really take out any unwanted yellowness. I usually leave in for 2-3 minutes – maybe once or twice between visits or before an event I’ll leave it in my hair for 15-20 to make sure it really gives me a silver boost. Admittedly, this is marketed as a way to get a lovely purple tint to your hair (very in right now) with a gentle leave-in conditioner for 15 minutes. I can tell you now, it doesn’t work for that. I left it on for 45 minutes and got the faintest tinge of purple – BUT it is the best toning conditioner I’ve come across. I’ve tried Touch of Silver Blue shampoo and have to say I wasn’t impressed – it dried my hair out (not good for already bleached hair!) and didn’t seem to have much of an affect. However, the confitioner is really excellent. 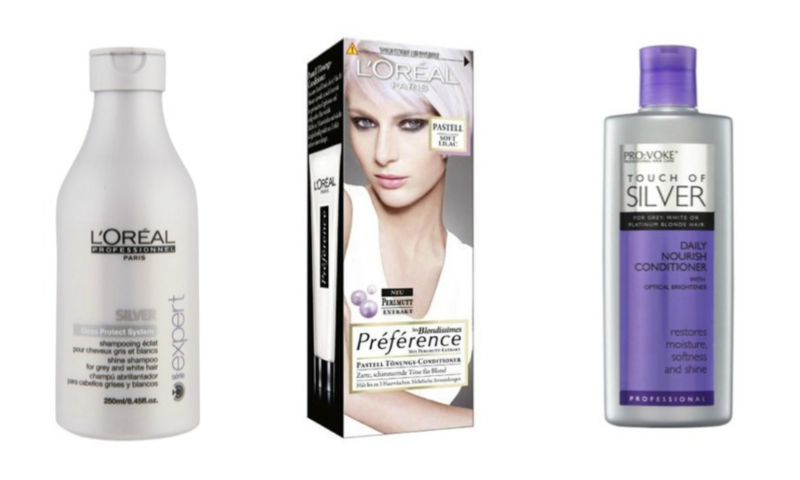 Sometimes the L’Oreal Feria can be hard to find – and it’s a smaller bottle, so I tend to use it less frequently, maybe once a week. This is what I prefer the rest of the time. Additionally, Touch of Silver also has a great dry shampoo line – I was always a Batiste girl but tried ToS on a whim and the difference was definitely noticeable – I suspect their nozzle is better as the dry shampoo came out as more of a mist than it does with Batiste. Note: Product Reviews, unless noted as sponsored, are completely unsolicited and my very own personal opinion.